Ducted or Non-ducted application. ADB or control kit required. This complete listing will come with the non ducted ceiling assembly (3314851.000A), it will come with everything necessary for a non-ducted application. 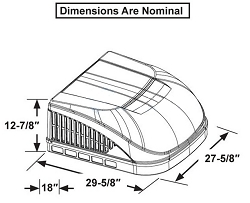 What makes Brisk air conditioners best-in-class of any standard RV rooftop air conditioner for their weight, air flow and capacity? There are various factors that combine to achieve market leading results. 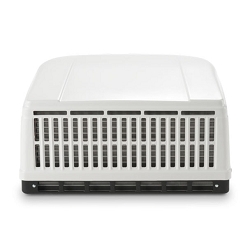 These include the large air openings which promote superior air flow and cooling capacity, while the EPP foam housing both reduces weight and also contributes to improved cooling. The Brisk is incredibly robust, components such as its carbon steel base have proven their durability by coming through vibration tests lasting for 30 hours and more! The optional heater function is ideal for use on cool evenings, with a multi speed blower for users to adjust according to their cooling or heating needs. 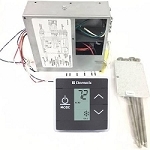 Finally, great care has been taken to reduce operating noise: with the motor, compressor and evaporator bracketed together for vibration-free, quiet operation. Long copper lines and dual rubber bushings are also responsible for minimizing noise and vibration. Allowing you to enjoy comfortable temperatures in peace and quiet! Cooler, stronger, quieter and lighter! The Brisk II puts it all together for an all-new, best-in-class RV air conditioner, starting with 15% increased air flow and improved cooling capacity. The unit also has a smaller carbon footprint, tighter specification allowances, and improved materials create energy efficiencies that reduces operating costs and environmental footprint while improving fit and finish - we call it smart design! 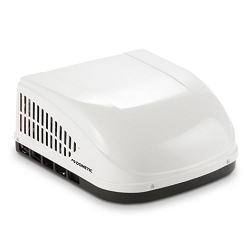 After two years of redesigning and re-engineering one of the most popular and most imitated RV air conditioners, Dometic presents the Brisk II 15K BTU Rooftop Air Conditioner - the stronger, lighter, smaller and more environmentally friendly RV air conditioner. The Brisk II uses its smart design and improved materials to maximize air flow and performance. 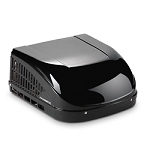 This newest RV air conditioner unit offers 15 % increased air flow and yet is 19 % lighter than previous models. 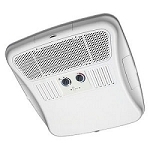 It's the smallest rooftop air conditioning unit available and is sure to impress. Product Description 13,500 BTU Rooftop Air Conditioner, Ducted or Non-ducted application. ADB or control kit required. I am very satisfied with my purchase from camperpartsworld. I ordered on Sunday evening, and my AC unit was delivered on Wednesday afternoon. Much quicker than I had hoped for. This thing was packed very well and survived shipping with no issues. I can't wait to get it installed on my camper! After scouring the web for what seemed like forever, I finally took the advice of a friend, and checked Camper Parts World. I just couldn't believe that a company could be selling these Dometic brand air conditioners for this price but I guess I had to see to believe. Great deal, Great Product. If I could rate 10 out of 5 stars I would!! !